Warm. Flavorful. Kick of spice. Comforting. For those of you that have had Brunswick Stew know exactly what I am talking about! Brunswick Stew can only be found in my home town (from what I have found anyways) and seems to only be sold from church fundraisers! Everyone I know stocks their entire deep freezer up with this stuff when it is being sold to hold on to through the rest of the year. 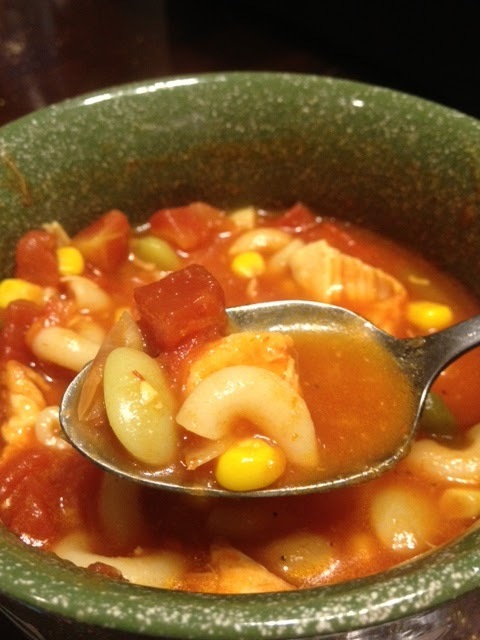 For those that know me, unless it is soup from Olive Garden or Brunswick Stew, I am not a soup lover at all! I found out an easy and fast way to make Brunswick Stew! Better yet...I found a way to make the "stew" into "soup"! Woohoo! No more waiting until December! Which was fantastic because I got sick this past weekend and needed this! Usually it doesn't have noodles...but I LOVE pasta and want noodles in almost everything I make haha. Start off by sauteing onion in olive oil in a huge pot over medium high heat until they are translucent. Add tomatoes, chicken, cayenne pepper, and lima beans. Cook for 2 minutes on medium heat then reduce to simmer for about 25 minutes. Add yellow corn, ketchup, and cooked noodles (if desired). Add tomato juice to desired thickness. P.S. There may be a lot of Chicken Vegetable Noodle Soup left..but don't fret! It is freezable! Just put them in Glad containers and stick in the freezer. 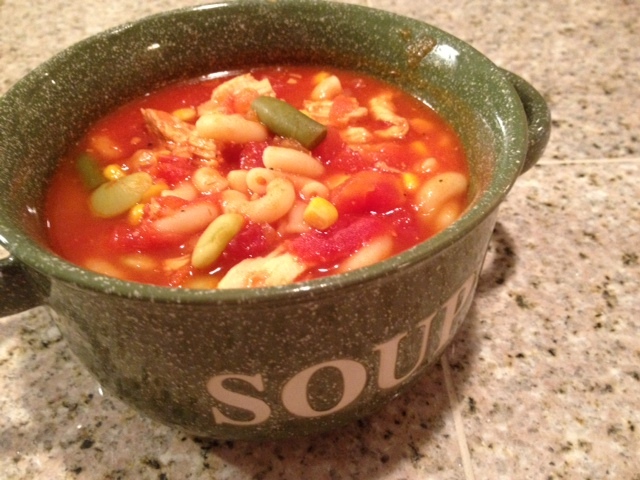 Pull out on a cold night when you are sick or don't want to cook, stick in the microwave, and voila! Homemade soup in a jiffy! 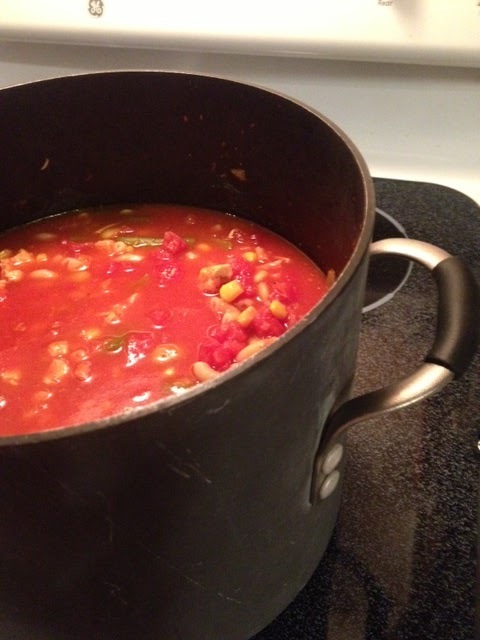 I´ve heard of brunswick stew but never paid much attention. But this soup sounds fantastic, and so comforting! Love your soup bowl! This does sound like it would be very comforting. I'm curious why this dish isn't more widely known. It looks delicious! I don't know either :( It's the best I have ever had! It must be a southern thing. If you ever find any though...you should definitely try it! Church fundraisers have the best food! Your soup looks wonderful too. I've never heard of this dish but I love chicken and noodles, plus the addition of vegetables makes it sound wonderful! There is nothing wrong with adding noodles, I do that a lot! My boys aren't huge soup fans, and when we have it, they will leave behind all of the wonderful broth. Seems like a waste. But if I add noodles, those noodles absorb the broth and flavor, so less is wasted :) It also makes the soup even more filling! Nice and spicy soup! It does look a lot different than the brunswick stew I've had around here (Metro Atlanta). Then again, it varies depending on your area. I pasta belongs in everything too haha. I'd eat it everyday if I could! Love this! 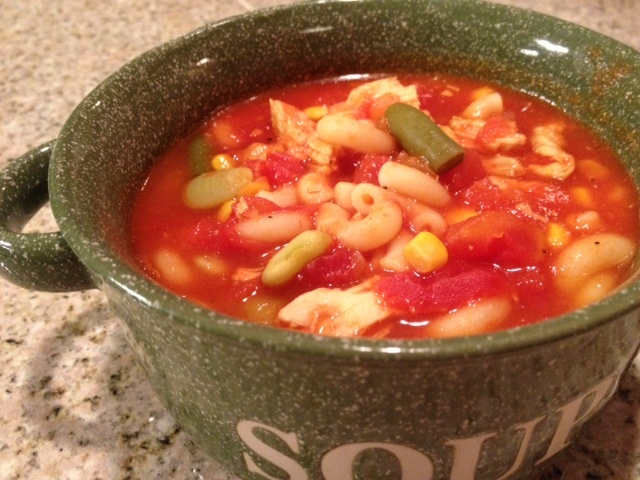 Brunswick Stew is one of my favorite winter dishes so I know that I'd love this! This makes me think of the one I made for work last week, so yummy! I just love soup. . like you said. . so warm and comforting. . your soup looks great! Bravo! I've never tasted Brunswick stew, but it sounds yummy! Today is another good soup day...wish spring would come!!! I am right there with you! Bring on spring time!! This is a lovely soup and I really like the cup you used. It's adorable. This is chock-full of so many goodies, it sounds delicious, comforting, and filling. Lovely!